Another great day! I woke up to the sun at 7amish! No rain. Whew! I grab some food and sit next to the ocean and watch waves crash against the beach. A great way to start the morning off. I had a papaya that I had saved but it leaked some juices in my tent and was too ripe so I had to toss it. The sun’s rays was coming through the clouds and was simply stunning. I took my time getting all ready to go. I leave at about 9am and start heading down the road. I continue down highway 137 and take in the ocean views and mellow ride. 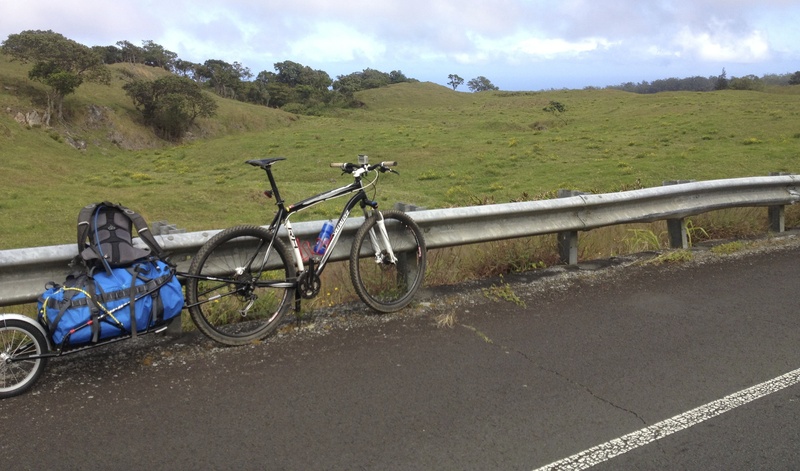 Little did I know that I would have a lot of climbing to do today…The road is fairly mellow until it turns right back towards Pahoa. That is when you start climbing. The road has a fair grade but it is consistent for 5-10miles. Up, up, up we go. 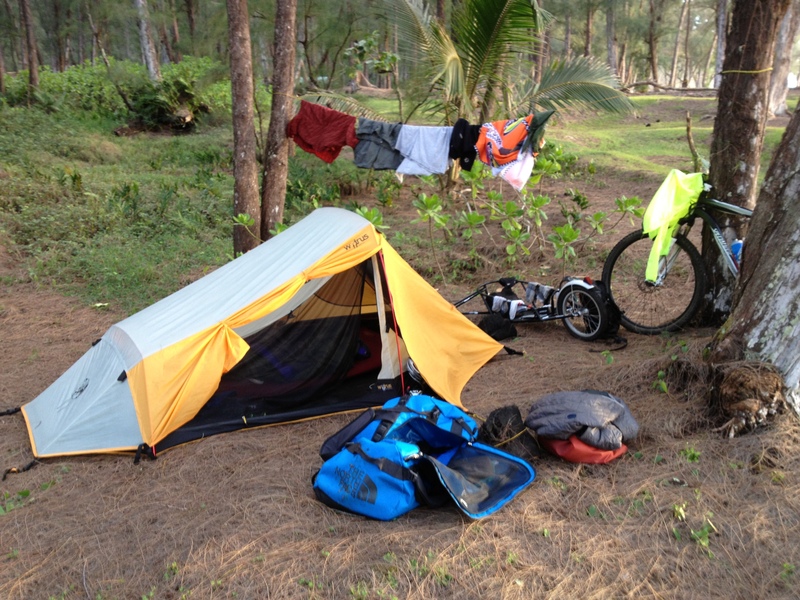 I go through several rain storms and arrive back to Pahoa. Back to the glamorous highway… Lots of traffic and sub-optimal scenery. I eventually get to Keeau, 30 miles from camp. I am exhausted. It is raining and I am drenched. I want some food! I see a farmers market off the side of the road and get a Thai lunch dish. It was a great deal. $8.50 for a healthy helping of food. I meet a local and his son who is back from college. We exchange a few words about the local area and life. After some food and a nice rest it is time to get back on the bike. 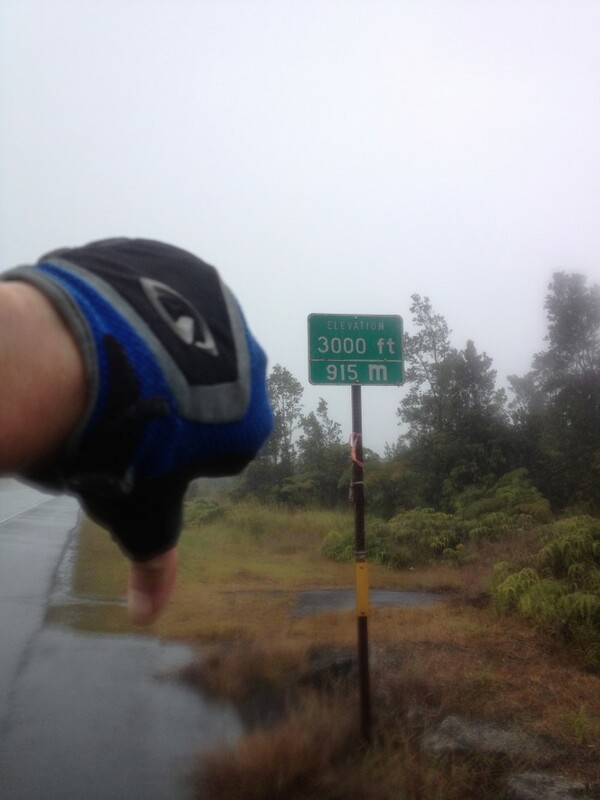 I was unaware of the terrain ahead…20 miles and 3,500ft later I make it to the town of Volcano. I was greeted with rain and went through several rain showers during my ascent. The rain will come and go. It is almost not worth putting on a rain jacket because you are able to dry off in between rain showers. As I got closer to Volcano, the temps started to drop and I was starting to shiver. I read a sign that reads, “Volcano Village Inn, next right.” Finally! As I climbed the road, it was really foggy and I could only see about 500ft in front of me. All I could see was the road climbing into the clouds. That sight was not very encouraging. Regardless, I made it! I pull off and go to a Thai restaurant. 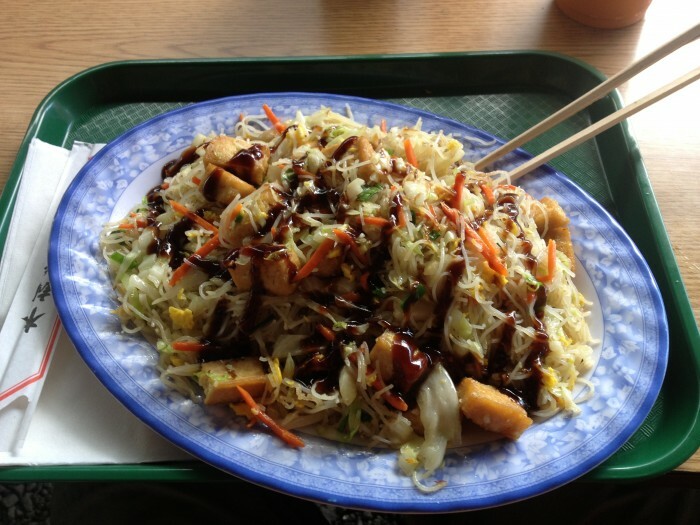 I get a Teriyaki burger… I wanted a burger. It was descent. I ask for directions to the Holo Holo Inn which is a hostel in the area that I had reservations for. I am reluctant to leave the comforts and roof of the Thai restaurant but the hostel is not going to come to me. I am able to find it tucked away in a residential neighborhood. It is really nice with a big kitchen, comfortable beds and hot showers! 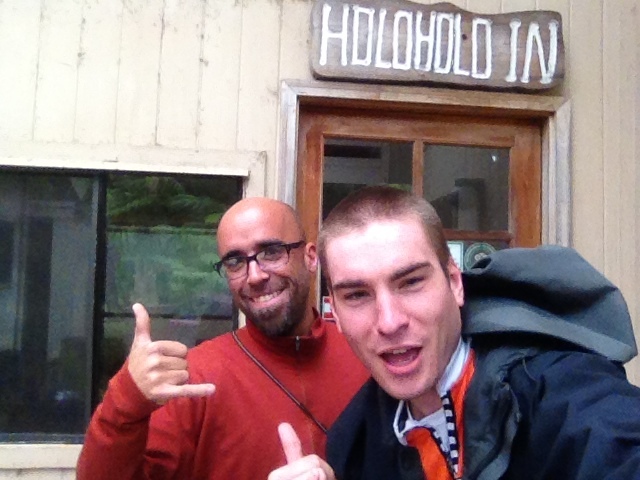 I meet several other travelers including Mike, who I had met at the Hilo Hostel. I had planned to check out Volcano National Park 1 mile down the road but was seriously unmotivated due to the rain. I am not sure where I am going to stay tomorrow. 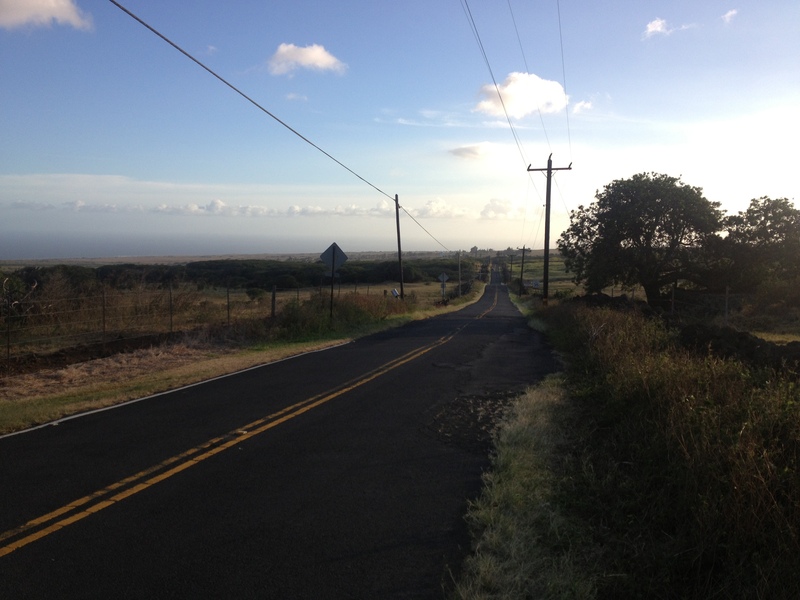 I want to head to the South Point Area and I want to check out Volcano National Park! It will be difficult to stay motivated if it is raining again. Other travelers say that it will be dry several miles down the road because of the climate variance. Sweet! I am ready to get my things dry! I will reevaluate tomorrow morning. Another great note is that the highway is 10-15 miles DOWNHILL! What a nice change that will be! Come on sunshine! I wish I could be your “support Team” what a great pictures and what a challenge this again must be even for an experienced rider like you! The food looks fabulous! Have a great Holiday time in Seattle and a safe flight home!